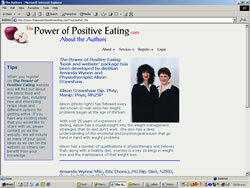 "The Power of Positive Eating" is the title of a book written by two Wellington based authors. The client wished to have a site that would both promote and enhance the book, by allowing the creation of a support community. The client also wanted total control over updating of page content. We built a site entirely in Macromedia Dreamweaver MX using Coldfusion as the process engine, and ultilising a Microsoft SQL database. The public side of the site is relatively simple in design, however all content is delivered from the database and maintained by the client via a series of online forms. The private site contains a custom written internal email system (between the members), a chat room, and discussion forums. Members can elect to be automatically notified via they own email address, when internal email is received. The client also has the ability to send out bulk email to members via online forms.